We all at one point or another look in the mirror and fixate on something we’d like to change. If only we were taller, more attractive, or thinner… When these thoughts become obsessive and start taking over our lives, they can mutate in to a multitude of unhealthy patterns. For many, the thought of gaining weight is such a devastating prospect that they will literally do anything to keep it off, including making themselves sick. This is fertile grounds for eating disorders to develop, including anorexia. Though it is more common in young women, anorexia can potentially affect anyone, even those who are underweight. It often begins in the pre-teen years or young adulthood. The disorder seems to be most common in caucasian women who are high achievers in school and who have a goal-oriented family or personality. The exact causes of anorexia nervosa are not known. Many factors may be involved. Genes and hormones may play a role. Social attitudes that promote very thin body types may also be key factors. Cutting food up or moving it around their plate instead of actually eating it. Disappearing in to the bathroom after every meal. Those who suffer from anorexia become so fixated with what they will or won’t eat that it takes over their lives, often shutting out friends and family in the process. Anorexics feel powerless in their pursuit of staying skinny that they will go to any extreme to lose weight. Regardless of how thin they may become, they will see themselves as needing to lose more weight. Those with anorexia typically deny having a problem. In reality, it is a serious and potentially deadly eating disorder. Fortunately, recovery is possible. With proper treatment and support, sufferers can break anorexia’s self-destructive pattern and regain health and self-confidence. Shades of Hope is a treatment facility in Buffalo Gap, Texas that can help someone struggling with an eating disorder or any other form of addiction. If you think that you or someone you know may have anorexia, we can help. 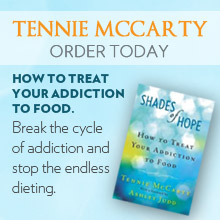 Visit www.shadesofhope.com or call 1-800-588-HOPE.